This year students at Manchester Metropolitan University are fighting exam stress by petting puppies and dogs in a new collaboration with the Guide Dog Association. 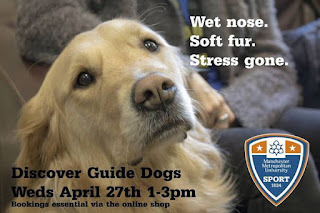 By making a £3.50 donation to the charity, students can spend 15 minutes in a room full of puppies and dogs to cuddle to their hearts content, while they learn all about the inspiring work of the Guide Dog Association. While the students get a lesson in de-stressing, the dogs also benefit from socialising practise - an essential part of their guide dog training. During a time when university stress levels are a nationwide concern, the university hopes that this initiative will relax students and help them to focus and concentrate on their exams. At the session, which takes place on 27th August, the dogs available to cuddle will range from puppies in training, working guide dogs and retired pooches.